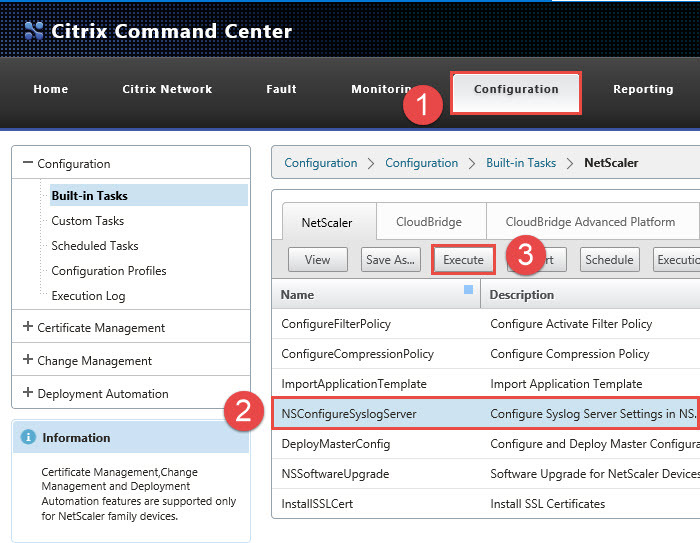 Citrix Command Center can be configured as a Syslog server for NetScaler. You can always opt to forward syslog events to other servers and does not have to be a Command Center server, but Citrix Command Center syslog capabilities may be adequate for your needs. Citrix Command Center has a “Built-in” task “NSConfigureSyslogServer” that can be used to configure the Syslog settings on multiple servers. That task can be utilized to configure the NetScaler appliances to point to a third-party Syslog server and does not have to be the Citrix Command Center server. 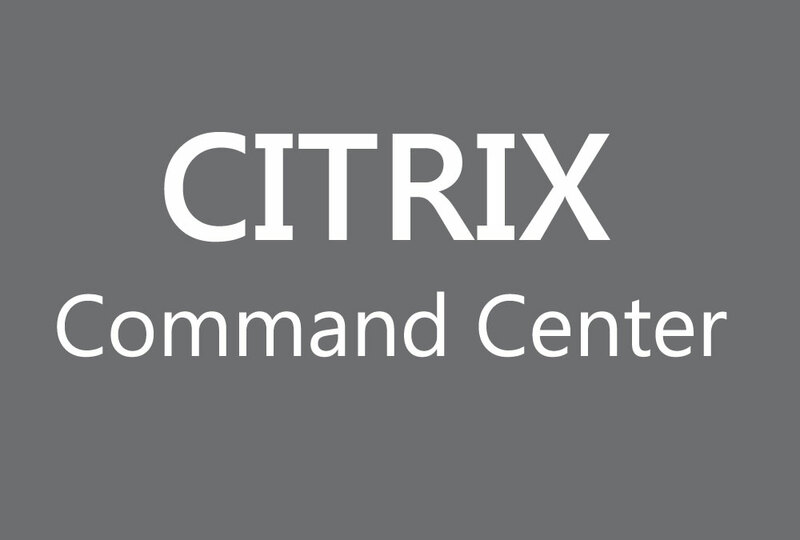 In this tutorial, we will utilize the Citrix Command Center server. Navigate to the Configuration tab, expand Configuration, Built-in Tasks, select NSConfigurSyslogServer and click on Execute. Select the appropriate NetScaler appliance from the Available Devices, and move it to the Selected Devices by clicking on the right arrow. Click Next. Enter the IP of the Citrix Command Center server, and enter a comment in the Comments text area. Click Next. On the View Summary page, click Finish. Check the status of the task, to ensure it Completed with status of Success. You can always enter this information manually on the NetScaler appliances, or you simply edit the just performed configuration. The default Citrix Command Center Built-in task, configures the Log Level to ALL. You may wish to change this log level to something more suitable to your needs. 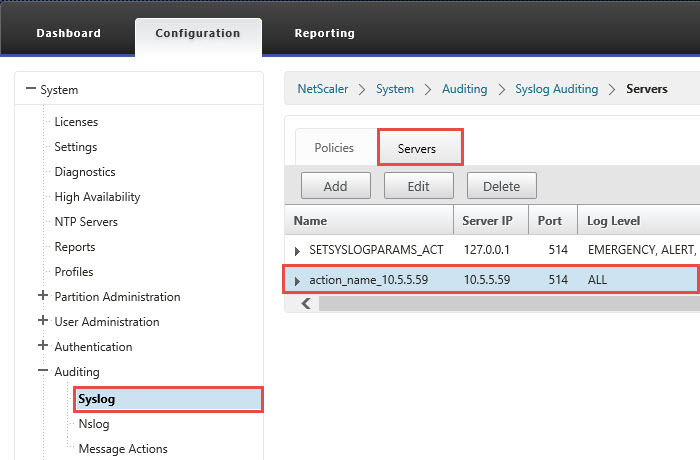 On the specific NetScaler appliance, navigate to Configuration, System, Auditing, Syslog and click on the Servers tab on the right. Then click on Edit. 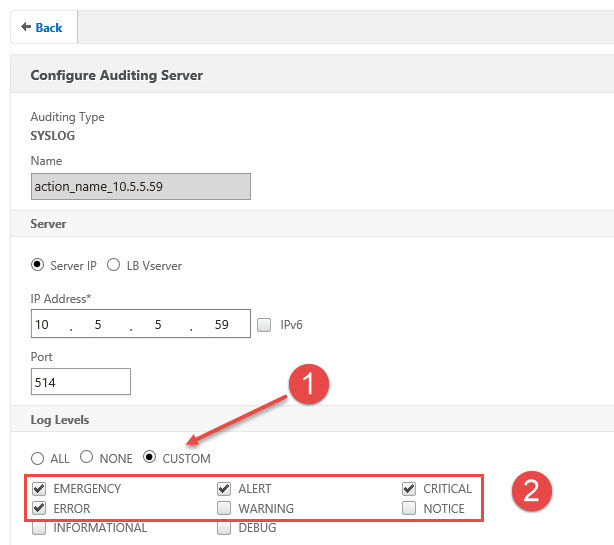 Under Log Levels, click the Custom option and select the options you would like events to be reported to the Command Center server.